Suppose for a moment that the unthinkable happens and the planet doesn’t warm for another decade – and then cools. The ramifications for carbon mitigation politics would seem obvious. Of course people have been saying this for some time now – and it usually leads to the wrong conclusion. That greenhouse gases have little influence on climate. Some more astute voices have been speculating about this potential since the turn of the century – and suggesting that with dynamic climate shifts there are even greater risks of extreme hydrological and temperature changes. Climate shifts happen at 20 to 30 year intervals – very much part of the internal variability of a complex and dynamic system. 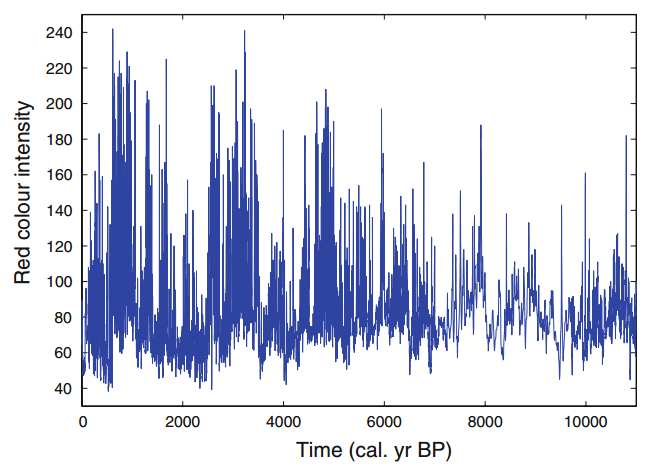 Shifts can be extreme and persistent – local temperature changes of as much as 10oC in a decade – megadroughts and megafloods such as we have not seen in the 20th century. Dragon-kings are Chinese mythological creatures – four of them in the north, south, east and west of the South China Sea – who live in coral castles guarded by crab generals and shrimp soldiers – and who inflict on us floods and droughts at their whim. More prosaically – they are defined as extreme events at times of climate shifts. The oceans are the place to look for climate change. The Argo ocean monitoring network is a system involving thousands of floats moving up and down in the ocean collecting data on heat and salinity. The system is a quantum leap in the reliability of ocean data. The graph below shows temperature changes during the year with a 13 month running mean over the period that the Argo system has been in operation. It was graphed by Professor Ole Humlum at his site climate4you. It is sourced from the Global Marine Argo Atlas database that uses the Scripps ‘climatology’ for consolidating float records. The annual cycle is due to north/south asymmetry in the proportion of land and water surfaces. The oceans warms more in the Southern Hemisphere summer because there is more ocean in the south. It shows a little cooling to 2008 and a little warming since. The oceans will inevitably cool a little as we pass a solar cycle peak and move into a cycle trough over the next couple of years. 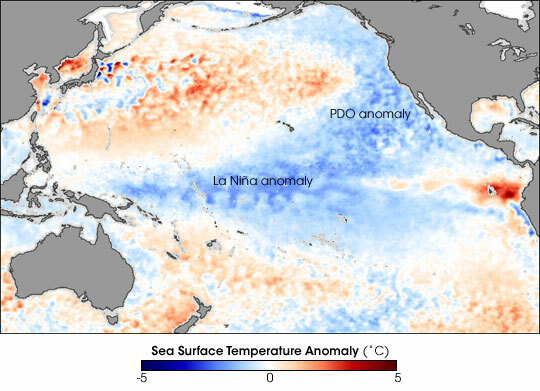 Oceans will cool as the next La Niña emerges – and will change in response to Pacific Decadal Oscillation states. The cold ‘V’ is the defining characteristic of the 20-30 year regime in the cold state. It cools the atmosphere by absorbing some heat – heat flows from warmer to cooler – and by increased cloud cover that changes the energy budget of the planet. We can see the influence of the AMO – in the north Atlantic – and the PDO – in the north-east Pacific – on US rainfall. At least part of the recent US drought is down to patterns of ocean circulation that have decadal to millennial variability. Warm or cool modes in the AMO and PDO persist for decades and then shift state. 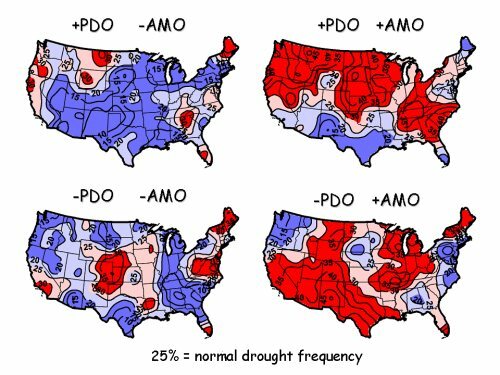 A positive (warm) AMO and a negative (cool) PDO is associated with reduced rainfall over much of the continental US and drought in the south-west. Disentangling this from anthropogenic change based on short term records of just decades is, frankly, an act of faith. These are not merely interesting speculations – the idea is the most modern and powerful in climate science and has profound implications for the evolution of climate this century and beyond. Whatever the cause – global hydrological and climate variability – extreme drought, extreme floods and extreme temperature changes such as has not been seen in the past century – will occur again. The next climate shift seems likely within a decade – and the scope and direction are intrinsically unknowable.